I mentioned this scope several times and here it is. This is a repro of the famous Unertl 8X used in WW2, Korea & Viet Nam. While I don't have one of the original military Unertls ($$$$$$) I have an 8X and a 10X Unertl and this repro compares very well indeed to the originals. In fact, due to multi-coated optics the repro is noticably brighter than my 8X Unertl. Personally I really like this type of scope and it's nice to be able to put away my collectables. The scope is mounted on the USMC 40X I purchased from the North Store in 2006. They looks so perfect together!! I am a very happy boy! Looks awesome, but I just don't know, $550 buys a lot of other stuff. Maybe after the tax return returns. What do you think of the mounts and adjustments vs unertl ones? Did it come with screw in caps? 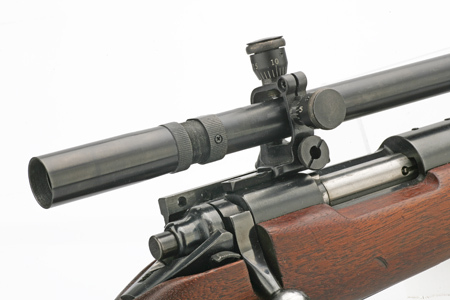 would this type scope work on a smaller .22 platform such as the Remington 513T? I purchased the scope directly from Leatherwood. I had gone to the Leatherwood site to get info on the 3X Malcolm and saw the "coming soon" announcement. Asked them to let me know the moment it was available. The mounts and adjustments compare very well to my Unertls. The mounts are dead ringers for what Lyman used on their Super-Targetspot scopes. 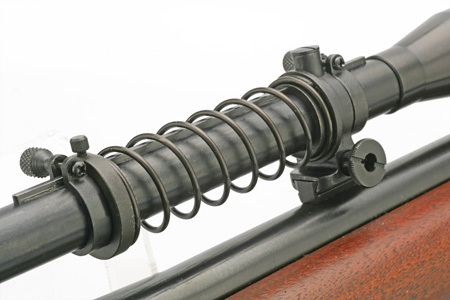 The scope came with caps and the recoil spring. The price? 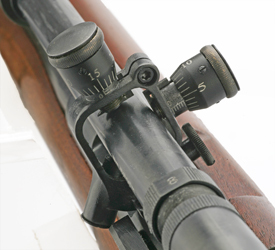 Well, if you want a scope like this it's a very fair price when you look at what originals cost. An original USMC Unertl would go for thousands. I paid $600 for an 8X Unertl Target and Varmint back in 2006. For me, it's worth it. This is my kind of scope! Amazing what a bit of research can do. The reason the mounts are dead-ringers of the Lyman mounts of the period is because John Unertl Sr. was not making his own mounts at the time but buying the from Lyman. 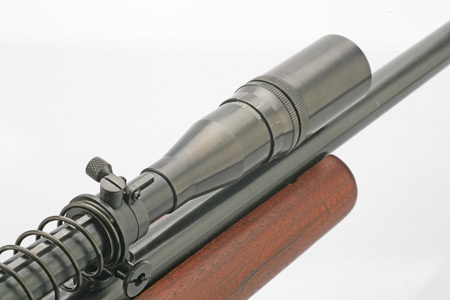 The importer of the 8x Chinertl reproduction scopes is Leatherwood - hilux. They are offering them to the trade as part of their "Wm. Malcolm" line of antique reproductions. The intial batch is probably fully subscribed but there is a list of dealers on the Leatherwood website. Although not listed there "ironsite" optics reported got a bunch. I believe Creed got some as well. ceresco: I went the route you were thinking about to get a 8 power Unertl to use at the Eastern Games. I purchased a Unertl 1 inch target scope 8 power and then put the eyepiece on a Unertl 12 power 1.25 inch Target scope. and now have a scope that is the clone of the USMC 8 power scope. This turned out to be pricey, as people know that they can get a max price for the 8 power Unertl scopes. I did order a Leatherwood clone to use at the games, as it does come with a warranty. Bruce J. $600 was a pretty good price, depending on condition, at least in my neck of the woods. Was it complete with mounts? Changing it to an 8X would be tricky??? expensive??? I'd think you'd need the guts of an 8X Unertl to do it. If you had an 8X Unertl for the guts, well you'd already have an 8X Unertl, right? Last edited by presidentg; 03-15-2012 at 12:27 PM.